Search our list of more than 60 birthday party locations, bakeries, entertainers and other sanity-saving services in the central Arkansas area. Cover Kid Photo Contest winner Elle Keathley embraces the birthday spirit. Special thanks to Newmark Moses Tucker Partners for use of the Arkansas Democrat Lofts where this shoot took place. 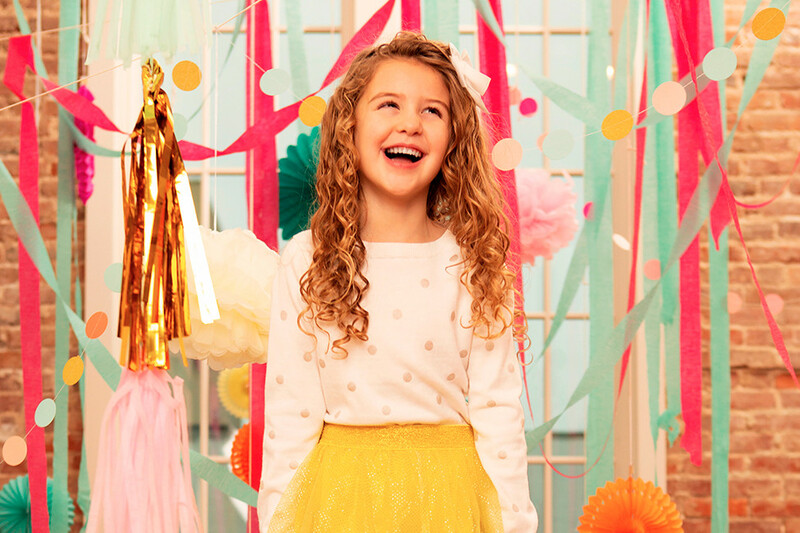 A key to the best destinations for your child’s next birthday bash, as well as entertainers, party supply stores, bakeries and more. Arkansas Skatium offers public and private roller and ice skating parties. Play mini golf, ride go-karts, compete in the arcade, try the ropes course and more. Enjoy pizza at a reserved two-hour party, which includes game tickets and balloons. Utilize a full-service restaurant in this fun, family-friendly arcade with dozens of games for partygoers to try. Host a private or public birthday bash at Joyland with food and refreshments available depending upon the party package. This indoor playground features seven massive inflatable slides, obstacle courses and bounce houses. Cinemark offers private party rooms and upgrades to a private movie screening are also available. Celebrate your child’s next birthday with loving farm animals including Rudy Roo Roo the Kangaroo, Humphrey the Camel and live pony carousels. Play with dogs and cats and enjoy arts and crafts. Available on Sundays only and dates must be reserved four to six weeks in advance. Use the private party room for 90 minutes, take a tour of the shelter and interact with animals. The staff will set up, decorate and clean up. Take a tour of the zoo, enjoy a show, hitch a ride on the Diamond Express, and have a meet-and-greet with some animals. Hold your party in a picnic area with room for the kids to play and trees where you can hang piñatas. Parties include two hand-led horses for riding. Blue Cake creates custom birthday cakes, petit fours and cupcakes all from scratch and specializes in tiered and sculpted cakes. Cakes, dozens varieties of cookies and pastries, petit fours, cupcakes, tarts and more are all on the menu at Community Bakery. The Cupcake Factory offers cupcakes and other sweet treats for your birthday kid and guests. Order treats for your child's special day from a menu of cupcake flavors baked from scratch daily using all-natural and organic ingredients. Dempsey is the place to get your gluten- and nut-free sweets and breads. The bakery also makes food free of soy, wheat and eggs. Pies, banana pudding and crème brûlée are the specialities at this delightful shop. This candy store and ice cream shop whips up handmade fudge, caramel apples, chocolate candies and more. Mickey’s offers a variety of cake flavors and designs along with other delicious pies, cobblers, french rolls, cake pops and other bite-size desserts for any celebration. The Pop Pop Shoppe offers delicious and unique flavors of gourmet popcorn perfect for a snack or dessert at your child’s party. This cupcake shop and bakery has a party room that hosts cupcake decorating parties for one sweet birthday event. From intricately iced sugar cookies to dipped Oreos and cookie cake, Whimsy Cookie Company offers more than a dozen types of cookie treats for your child’s party. Use the open studio and have an “art buffet” party or choose a themed party with a specific art project. Each guest can create his or her own pottery, mosaic or silver jewelry. These themed parties last 90 minutes and include crafts, hair styling, glitter makeup, nails, beverages and paper goods. Kids can let their creative juices flow at Pinot’s Palette during a private birthday party. Learn to use a sewing machine among friends while making fun take-home projects such as fashion accessories or cute stuffed animals. Partygoers get creative with canvas and make a painting to take home. Spirited Art does not have a studio space but will come to you for a party. Packages include admission for children and adults and a private party room for two hours. Professionally-trained staff arrive in costume to sing, read, dance, and entertain your little one and guests. Joey the Friendly Fire Truck teaches fire safety in a fun way and is locally owned and operated in central Arkansas. Brian Kinder brings fun-filled, interactive children’s music to your party. This fun, interactive magic show includes tons of comedy, a puppet routine and balloon art. Enjoy a fun, interactive magic show where the birthday child helps with the magic tricks! Parties include a reserved table, kids’ meals with drinks, and balloons. Throw a Purple Party at this ’50s-style diner and soda fountain. Take a guided tour and the guest of honor will be the captain of the day (or night if you book a sleepover party). Use the private party room for one hour for up to 20 guests; party package includes snacks and admission to the museum for a full day. Choose from an array of theme packages that fit your child’s interests, from Lego to dinosaurs to mad scientist. The indoor pool and party rooms are available for DIY parties. Enjoy a hayride, games and riding the horses for a real cowboy party. During summer, enjoy the Splash Zone family aquatic park. The community center also has an indoor pool, gym and banquet hall. Pavilion rentals are available and little ones can hop on the carousel, train, Tilt-a-Whirl and other small amusement rides. This decorating service transforms your party zone with balloon creations, including giant numbers, arches and decor to match your party theme. Find invitations, stationery, gift tags, custom napkins, custom cups, matchbooks, stickers and more. The store carries a large selection of European and unique specialty toys, crafts and gifts to pique your child’s curiosity. Party Time offers tables, chairs, tents, fine linens and more for rental along with an experienced staff to help you put it all together. Find plenty of goodies for a chic birthday bash, from trendy invites and decorations to fancy favors and wrapping. Have a party with a purpose by volunteering for a shift at the Arkansas Food Bank. All Star ATA provides fun party activities including a 30-minute karate class, karate relay games, ninja dodgeball and more. Jump around on 20,000 square feet of interconnected trampolines, climb around a foam pit and play dodgeball and basketball. Spend your child’s birthday at the ballpark for an unforgettable experience. Use the picnic area and play Wiffle ball, dodgeball, or both with a party coordinator. Ages: All ages until 8 p.m.
Make your child’s birthday party a strike at this six-lane bowling alley, two of which are in a private room available for reservation. Kids will play fun games like Ninja Dodgeball, participate in a high-energy Taekwondo class, and the birthday child can cut the cake with a Samurai sword. Private birthday parties include invitations, birthday leader and assistant, set-up, clean-up, paper goods and drinks. Choose from one of six packages, each including a personal party coach, cake, ice cream, drinks and balloons. Parties that include 90 minutes of climbing followed by 30 minutes in the party loft. Choose between tumbling or swimming; parties include drinks, party wares and balloons. Enjoy one hour of bowling and shoe rental, time in the private party room, invitations, cake, drinks, a party host and more. Play sports and games or swim, explore the “soft play” maze, and hang out in a private party room, with ice cream, cake, drinks and favors. Parties include one hour of bowling, shoe rental, party set-up, food, bowling pin souvenir and a party host. Play on a pirate ship or tumble track, go through an obstacle course, or enjoy other games and gifts. Try a ninja obstacle course, twirl around on aerial silks, fly off a trapeze, make your way across slacklines and jump around on dozens of connected trampolines. Each group gets access to the locker room plus has playing time on the field.